The All Saints Acolyte teams are made up of church members ranging from age 6 through adult. Teams serve once every 4 weeks, with combined teams for special services and events. Our motto is "We adapt!" Anyone can be a part of this ministry. If you are interested in joining a team, please contact Amy Floyd or Libbet Turner. All are welcome to join and participate in any of the worship services held at All Saints, Warner Robins. Our worship services blend tradition with our unique culture and seek to capture who we are as a faith community. Joy, laughter, song, solemnity, the quiet of prayer and the rich sound of children being children are all a part of who we are at All Saints. For some, getting used to a tradition centered around communion takes some getting used to. It is rich and worth discovering. Everyone is new once. No one, especially your priest, will worry if you are new or can’t follow everything. The key is that you are here seeking God. Come. Experience. Pray. Breathe. Special liturgies take place on selected feast days and during Holy Week. Festal Eucharists include celebrations on Christmas Eve, Easter, Pentecost, and All Saints’ day (the first Sunday in November). These special services include incense, which may affect allergy sufferers. Sundays, 10:15 a.m. This contemporary-language service features organ, choir, traditional hymnody and rich Anglican liturgy. Our Rite II liturgy is found in the Book of Common Prayer (BCP) and employs modern language. This service includes Holy Communion and a sermon. Nursery care is available in our office building ahead of the service and throughout. Many parents will, at the end of the announcements, go and bring their children to the rail for communion. Please know that little ones are welcome throughout the service. If you have never taken Communion or are curious about the ritual and the meaning behind it, we invite you to visit how2charist.com for a full tutorial. Choir: If you have musical gifts and would like to use them in the liturgy, come and talk to Kip Gill before or after service. The choir practices Thursday evenings at 7 p.m. and Sunday mornings at 9:30 a.m.
Holy Baptism is scheduled with individuals and families who wish to receive the sacrament. Except on rare occasions, Baptism is celebrated in our regular weekly Sunday service so that both the community and the baptized might experience this special in-breaking of God’s grace. Confirmation for adults or for youth leads either to the Cathedral in Atlanta to witness the breadth of the Diocese of Atlanta or occurs here in Warner Robins at the Bishop’s visit. 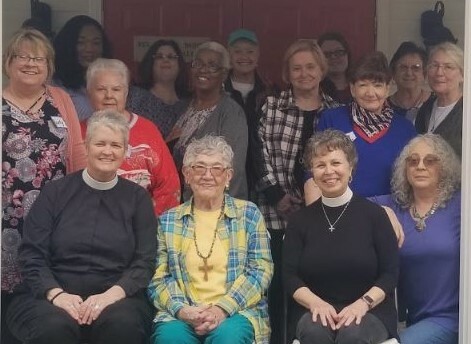 Daughters from local churches joined the Mary’s Heart, Martha’s Hands chapter for a Quiet Day with the Vicar of Atlanta, the Rev. Donna Mote, on March 2, 2019. All Saints is home to the Mary’s Heart, Martha’s Hands chapter of the Daughters of the King (DOK). The Order of the Daughters of the King® is an order for women who are communicants of the Episcopal Church, churches in communion with it, or churches in the historic episcopate but not in communion with it. Our membership currently includes women in the Anglican, Episcopal, Lutheran (ELCA) and Roman Catholic churches. The order focuses on prayer, service, and support of the priest. For more information about the Daughters of the King, please speak with Stephanie Johnson or Beth Wood.